Apologies for the potentially late arrival of this instalment, but the Internet connection here is flakier than a three day old croissant, so I'm typing this locally with a view to bunging it online when the motel's Anbaric Clever decides to talk to the outside world again. I am beginning to think that Dave Lee Roth actually made good on his threat to destroy Muzak - the tunes in the motel lobby in Grand Junction included Steely Dan, The Kinks, Creedence Clearwater Revival and The Who. On the other hand the Wireless-with-Pictures in the breakfast area was showing Fox "News". Apparently Egypt and the UAE have bombed Libya without asking permission first, and various USAnian Congressional stooges are up in arms about it. Quite right too, it's not as if the USA would launch air strikes on Libya without, er, as you were. If you look on the map, you will see that Grand Junction and Moab are not really very far apart at all, and further that the Mighty Colorado disappears into the wilderness shortly after Fruita. 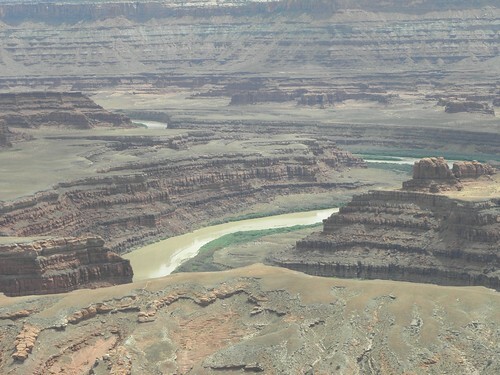 So I took the opportunity to visit some of the bits of Scenery adjoining Canyonlands National Park that I missed in 2003. But first... I managed to find the junction on I-70 which takes one to the Scenic Route - UT-128 - into Moab, following the Mighty Colorado during its brief reappearance into Civilisation at Dewey Bridge. The remains of Dewey Bridge. It is not recorded whether there were ever Huey and/or Louie bridges. It was built in 1916; fortunately there is a more recent one off to the left which hasn't fallen to bits. I've mentioned the canyon through which the Mighty Colorado passes hereabouts, but I can't remember when. 2010, actually. 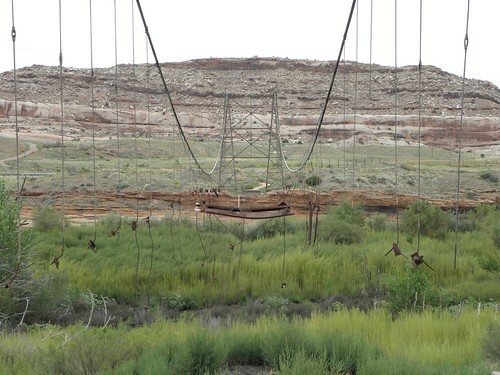 At US-191, two miles north of Moab, is the last bridge over the Mighty Colorado for some considerable distance, as the river once again vanishes into the hinterlands where you can't get at it without a boat or a proper 4WD vehicle. You can follow the river some seventeen miles further on UT-279 past the Cane Creek potash mining and processing facility, but there's not much there except a potash mining and processing facility, some railway sidings and a large quantity of Rocks. Backtrack from here, north a few miles up US-191 and then left on UT-313. 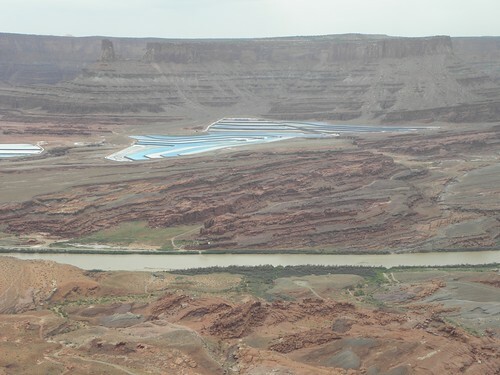 This is the access road to the Island In The Sky area of Canyonlands NP (approximately 1/7 of a Wales in area, comparison fans) and also for Dead Horse Point State Park. Dead Horse Point itself is only about four miles from the potash wossname as the vulture soars, but it's also two thousand feet higher up so the views are quite spectacular. The ham and egg wrap was nice too. The next place on the agenda is Needles Overlook. On a clear day you can probably see this from Dead Horse Point, but it wasn't a clear day. Rain was visible to the south-west, y'see. 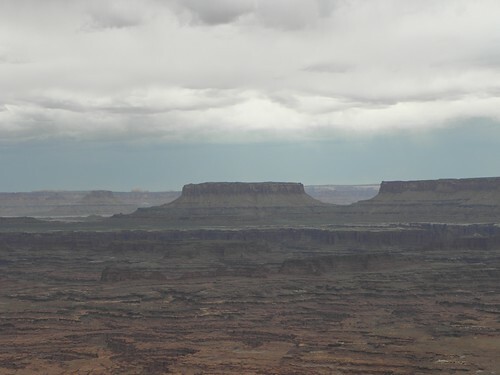 To drive there from Dead Horse Point is almost ninety miles, so not quite as impressive as the gap 'twixt North and South Rims of the Grand Canyon but a fair flog all the same. On the southern edge of Moab there are road works. Carwash! says the flagger controlling the single-line operation as I pass. Clever of him to notice. Anyway, quite some distance south of Moab is a junction, from whence a madman felt it a good idea to build twenty-two miles of road through bugger all to get to the edge of the plateau. It's worth it, though. You pop over a rise about a mile from the end of the road and there's this insane jumble of rocks, mesas, rocks, buttes, rocks and occasional glimpses of the Mighty Colorado. The quantity of motor-spirit left in the tank looked a bit marginal for the 34 mile detour on top of the sixty-plus back to Moab. The seals on the Mudstang's boot lid are far from dust-proof. It was worth the trip, especially as the rain held off until I arrived. The roof had been down for the whole day up to this point, so I can't really complain. 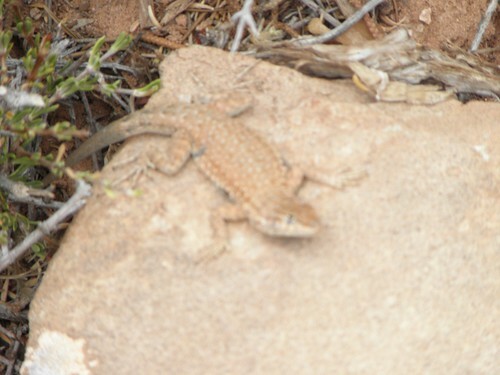 And then back to Moab. With, as it turned out, twenty-six miles-worth of motor-spirit left in the tank. Last time I was here was in 2012, when I was Crippled by Crappy Chrysler. Fortunately when Chrapsler revamped the 200 range earlier this year they dropped the convertible And Moab may be one of the best places in USAnia to make good my threat to obtain a spork to consume my breakfast cereal. In 2012 I was at the other end of town; this year I'm almost opposite 900 North Main Street, the Sunset Grill. This was formerly the hilltop mansion of "Uranium Charlie" Steen who first discovered uranium in these parts, making himself rich and putting Moab firmly on the map. On beds: The bed in here is advertised as "Queen size". I know Missis Kwin has shrunk a fair bit since the Coronation but I think even she'd be hard-pushed fully to stretch out on one of these.